I've decided that I want to get all the parts for this pan and tilt this week as I need to order some special connectors to fix a Mac Mini. So that means finally finishing my schematics! Lets just say that working with EAGLE is more interesting than I had planned. This design is by far the most complicated one I have ever done before, I'm sure that is affecting my results a bit as well. 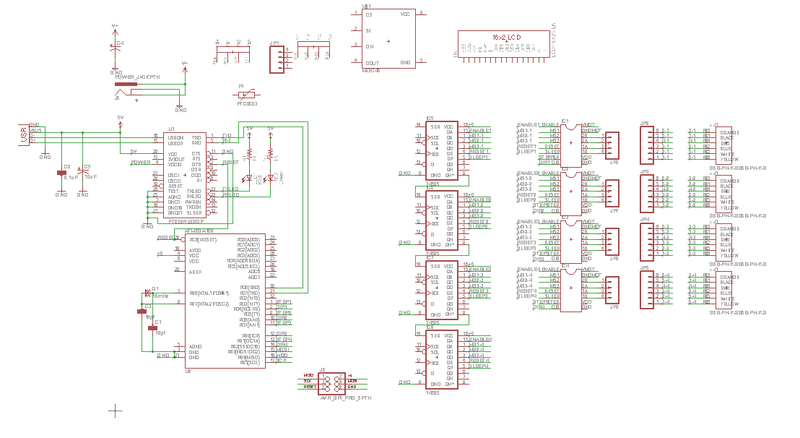 I've got a lot of clean up to do on the left side of the schematic, but here is what I have so far. The whole thing is run with a standard ATMega328 chip - I could have gone with a larger chip with more memory but I think that the 328 will run well for now. Plus I have the same chip on an arduino board so it is a bit easier to prototype. I'm planning on being able to run 4 separate stepper motors simultaneously with the design; pan, tilt, slide, and an aux motor (focus?). It gives me a lot of room for expansion down the line. I've definitely got pan and tilt now but I plan to make a slide dolly in the future. I'm running Stepstick motor controllers, so a lot of the circuitry is already taken care of. Most of the trivial settings for the stepsticks are connected via shift register on the ATMega to save pins (functions like microstepping and sleep). Those are then connected to header connectors on the board. I've kept away from directly wiring the outputs of the stepsticks to the stepper connectors because there are many different stepper motor pinouts and I can connect them in a higher speed or a higher torque setting as needed. The board, however, is a mess. I'm running the freeware version of EAGLE so no 4 layer boards for me. :( This makes layout quite interesting as I've got to figure out where all of these gigantic through-holes are going to be as well as the smaller SMDs. Not to mention I still have to wire up the LCD display, a joystick controller, and a control button array. Hopefully more will come soon! I know, it's been a year with... nothing! And to complete that, this is another cliché post about me not posting a lot. Well, some updates are in order! I am still working on my Pan-and-tilt project. It's been a year, and I just want to get it done. I think I am on the fourth? prototype now. I have sourced an enclosure, upgraded the design, and right now everything tests well. 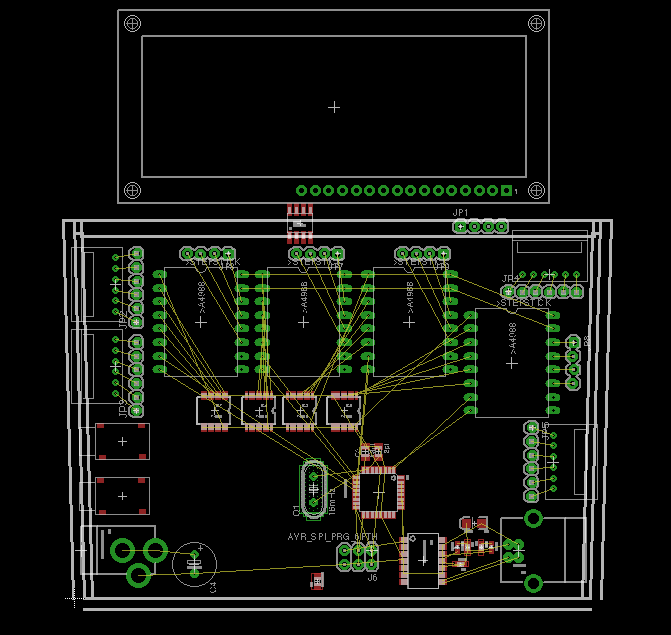 I am working on designing the PCB and writing the firmware. You know those dampers I talked about in my last post? Well, I got some planning on completing the design, you know, a year ago (geez...). On SeeMeCNC I got a group order going, and after it ended, people kept on asking for them. Now I've begun selling dampers as a side-business. I don't make a lot of profit, but I enjoy the logistics so it's pretty fun. 3D printer has been scrapped. Yep, scrapped! After hanging around on 3D printer forums for a while I've decided that I just want a nice kit to start out with. I've begun saving for a Rostock MAX V2, but seeing as I will be heading to college in a year, this is a long term thing. I'm guessing it will be a year, maybe two, before I actually buy anything. It'll likely be the V4 by then! I've started building a scale-model TARDIS as an HTPC machine. It will hold somewhere around 14TB of hard drives, which will contain my backups and 200+ hi-res movie rips. I've expanded my electronics "lab" a whole lot, and gotten a lot more equipment. I have a Hakko hot air rework system, Hakko 888 soldering iron, and Hakko preheater. All of these I've gotten for really good prices on eBay. At least there is something my patience is good for! I think I've gotten the entrepreneurial bug as well, as I have started an iPhone/iPad repair business! I plan on repairing 5-10 phones a week as I will be in school. It's no full time job, but I think it will double my monthly income as I have a part time job. So, if anyone out there is listening - I'm back!